As I'm sure most parents will agree the weekends seem to fill up so quickly with chores and child-focused activities (multiple soccer games, birthday parties, etc.) that sometimes there's simply not enough time for yourself. For me that means not having time to cook what I was hoping to, and on those occasions I need a good, quick, standby that doesn't require too much prep time. 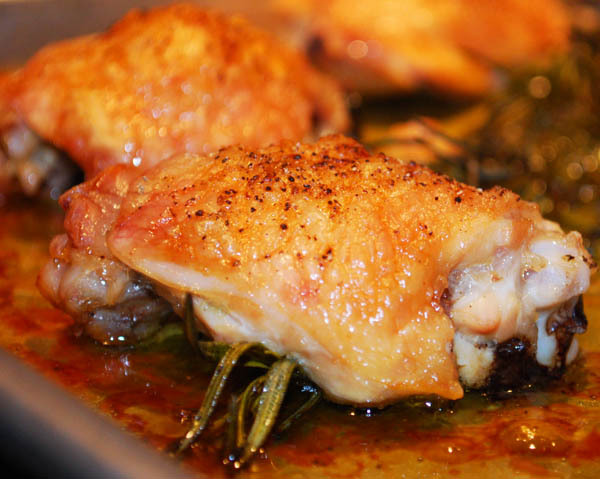 This rosemary garlic chicken recipe is so easy, the hardest part is preheating your oven. The kids love it and you end up with some nice roasted garlic cloves when it's all done. With the back of your chef's knife, smash each clove of garlic and remove the skin. Scatter the garlic cloves on a large sheet pan. Distribute the rosemary sprigs on the sheet pan as well, then place the chicken parts (skin side up) on top of the garlic and rosemary. Drizzle the olive oil over the chicken pieces, then season each piece of chicken generously with salt and pepper. Roast in the oven for 1 hour, basting every 20 minutes with the pan juices. I love those food with lot of garlic.Hmmm..sounds yummy!Can't wait ti eat this.